Knowledge and Learning is an extremely broad term. And when “learning” conjugates with the term “apps”, then there exist ample number of software falling under this umbrella, offering by including both first party and third party developers. Mobile learning has become the newest mode of education, tablets have become part of classrooms and apps are replacing the hard-bound books. Though apple was one to start this craze of app based learning but the trend is changing. There are many apps available on Google Play Store making iOS the favorite development platform for most developers, since Apple is still streamlined to iTunes store only, making learning apps equally accessible as in i-pads. Using a smartphone or a tablet for learning makes a complete sense, since it’s a device that is with you almost all the time. Since, a smartphone or a tablet is easy to handle, hence it makes learning possible anytime and anywhere. There are metric tons of resources and apps available on Google Play Store but perusing the apps and differentiating them as best and fad is not a simple task. There are various types of learning apps available in market, ranging from fields to subjects to the type of examination. People often get confused when they need to decide between two products and when it comes to studies it gets quite common for the students to fail in deciding between two learning apps. 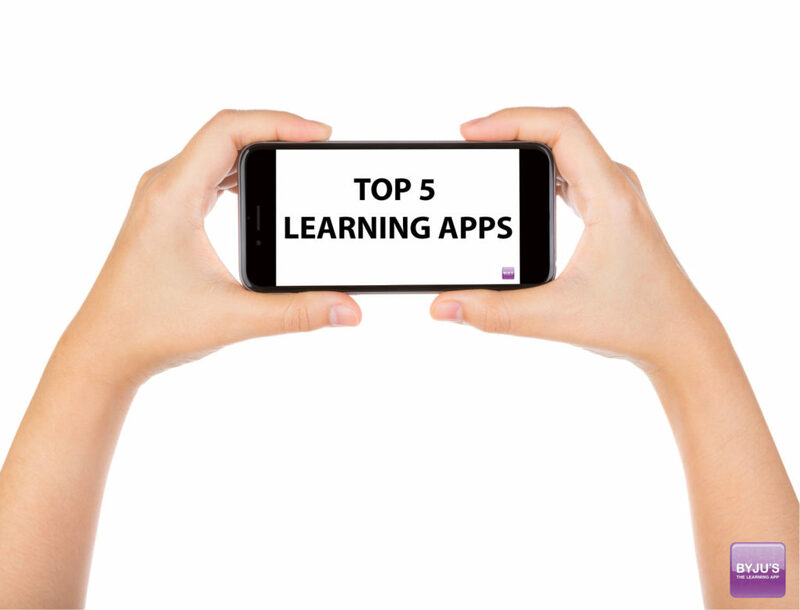 Here we present top five learning apps present on Google Play Store. You can choose the app that suits your requirement in the best possible ways, as your requirements can be vibrant. Maybe you are simply looking for ways to exercise your brain, be best in your coursework or crack standardized exams like GRE and GMAT, you have apps for all. BYJU’s learning app is a tablet based applicationavailable for wide array of courses ranging from classes 6th to 12thincluding all subjects to some of the standardized and competitive exams like GMAT, GRE, CAT, IAS, JEE, NEET, K12 etc. This app includes video interpretation of every individual topic along with self-assessment tests following each chapter. Along with these the app provides instant result so that the student can know the flaws and strengths. BYJU’s learning app is an amazing app that has brought a revolution in the field of learning by making education fun. It truly livens its mission and vision of “making you fall in love with learning”. From amazing animation videos to interactive and evaluative materials, BYJU’s learning app is helping millions of students, like us, to achieve their goals. This BYJU’s learning app helps in clearing the basics of all subjects making preparation concrete to excel any examination. The methods used by the teachers to explain the topics are impeccable and extremely appealing that no one has ever seen before. And the biggest benefit of BYJU’s learning app is that you don’t need an internet connection to view the videos, hence learning is possible anytime, anywhere. Khan Academy is not only a learning app but you can find all its content on YouTube as well as on its official website. The Khan academy is not confined within any domains but is a place where you can learn anything and everything and that too free of cost. Khan Academy has gained its recognition especially in the rural sections of Asia and Africa. The mentors and tutors of khan academy are extra-ordinarily amazing and explain topics in greater depth. The only disadvantage associated with khan academy is that you cannot download the videos and even for streaming the videos you will need high speed internet connection along with good devices. Amazon kindle is ranked among top five learning apps though it does not provide any video lectures or assessment tests but you can read any book at really cheaper costs making it favorite of all students. Mendley is mainly useful for researchers or Ph.D. students as it helps student to showcase, collaborate and connect with other researchers. If you are planning on starting your career as a researcher, then Mendley can prove to be a true boon for you. Edx is not only a learning app but you can access it through your system as well. Edx offers online courses offered by world renowned universities and by paying a minimum amount of course fee anyone can access the materials and the amazing thing about edx is that all its certificates are genuine and accepted by all.